The reports – or rumours, as some have called them – that the European Central Bank may decide to buy eurozone corporate debt couldn’t have come at a better time for high-yield bonds. A report by Austria’s Erste Bank shows that over the past two weeks, the restlessness in equities has also been felt by corporate bonds, and particularly high-yield bonds. This is because investors are becoming more prudent and differentiate more strongly between the various high-yield bond classes that come with very high risks, according to the report. Issuance of corporate bonds has also fallen, with the primary market affected by the eurozone’s gloomy economic outlook. In the year to date, October was the month with the second-weakest issuance volume – behind August, which is traditionally a holiday month in Europe. Risks are being reassessed, especially in the high-yield bonds market. 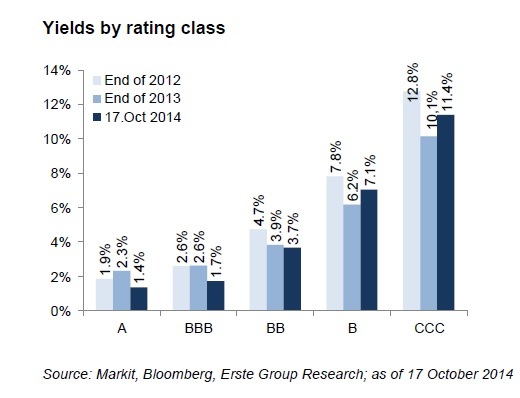 For corporate bonds in the junk categories B and CCC, yields have increased by 87 and 127 basis points, respectively. The fall in yields that primary markets had gotten accustomed to for new issuance has also come to a halt, with yields increasing slightly in the third quarter. “We expect investors to differentiate more strongly between the various issuers. They want to be adequately compensated for the risks they take in spite of the low interest rates and the low expected default rates,” Erste’s analyst Alihan Karadagoglu wrote in the report. A recent report by rating agency Moody’s highlights the fact that the high-yield bonds due to be repaid next year and in 2016 belong mostly to companies in cyclical sectors like mining and metals, transport and the auto industry. “The high refinancing volume and the weak fundamentals should cause higher spreads for the new issues in metal and mining,” Karadagoglu said. For the short term, investors are looking to the ECB’s releasing of the asset quality review (AQR) and eurozone banks stress test results on Sunday, October 26, for clues on the health of banks in the eurozone. This entry was posted in News and tagged AQR, asset quality review, banks, bond spreads, bonds, central banks, corporate debt, ECB, eurozone, eurozone economy, high-yield bonds, interest rates, investing in bonds, investing in equities, monetary policy, quantitative easing, stress tests on October 22, 2014 by Antonia Oprita.